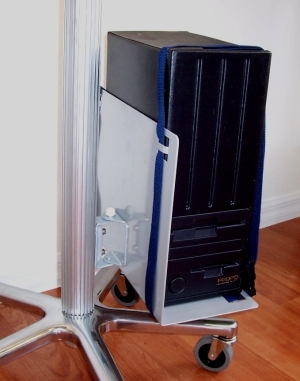 This is the original CPU holder shelf which comes included in the CUZZI VC01 Pole Computer Workstation. It is also used for holding UPS -Uninterruptible Power Supply- units. It is attached to the VC01 Workstation's pole with the included hardware to catch onto the slotted aluminum pole. The holder includes 2 adjustable straps to securely hold the unit placed on the shelf.